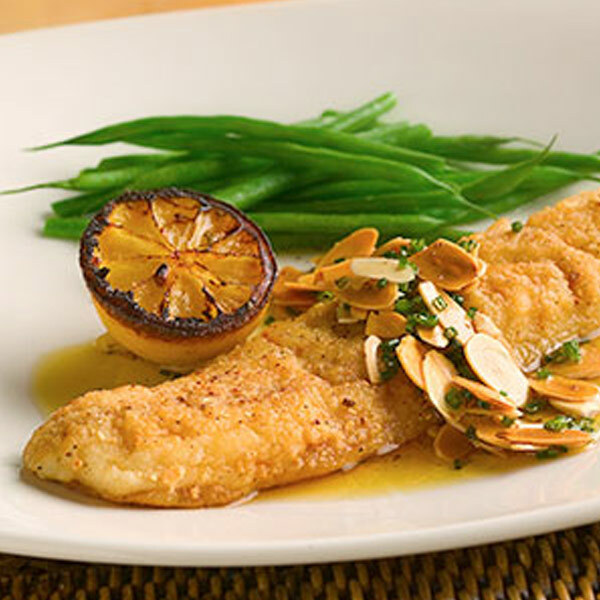 It doesn’t get any more classic New Orleans than trout amandine. All the traditional restaurants in town serve a version of this, but we like ours the best. We toast the almonds to bring out their nuttiness, and the thyme and lemon add complexity. It’s a very simple, elegant dish—you taste the fish as opposed to complicating it with flashy garnishes and sides. Thankfully in New Orleans, dishes like this are still appreciated. In a large skillet toast almonds over low heat, stirring occasionally, until just browned about 3 minutes. Reserve 1/4 cup toasted almonds for garnish. In a food processor process 1/2 cup almonds, flour, salt, and pepper until finely ground and transfer to a bowl. In another bowl whisk together egg and milk. Season trout with salt and pepper and dip in egg wash. Dredge trout in almond flour and set aside. In a large skillet heat 2 tablespoons oil over moderately high heat. Add 2 trout fillets and cook 30 seconds. Reduce heat to medium and cook 1 1/2 to 2 minutes, or until fish is browned. Flip fish over and cook 2 to 2 1/2 minutes, or until fish is firm and cooked through. (If almond crust starts to burn, lower heat and adjust cooking time.) Transfer fish to a platter. Cook remaining fish in same manner. Add butter to skillet and melt over moderate heat. Cook butter until brown with a nutty aroma, about 2 minutes. Squeeze lemon into butter and add thyme sprigs and cook 1 minute. Spoon sauce and thyme over trout and sprinkle with toasted almonds.